Paul Klee was a child prodigy violinist who in the 1890s abandoned a professional career “in view of the decline in the history of musical achievement” – his taste began with Bach and ended at Mozart. He set out his alternative path as “first of all the art of living; then as my ideal profession, philosophy and poetry, and as my real profession, plastic arts; in the last resort, for lack of income, illustrations”. That mix of romanticism and pragmatism characterises every aspect of an oeuvre that is among the strangest in classical modernism. 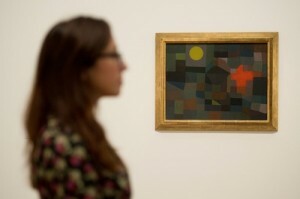 The beautifully spare installation of Tate Modern’s new show Paul Klee: Making Visible, spread across 17 rooms, does justice to an artist who is often a challenge to museums. Klee, so private as to be hermetic, worked at a miniaturist scale and is impossible to categorise, resisting dogma so instinctively that whenever he came near an art movement, he subverted it. Across the surface of the luminous coloured squares of Klee’s “Redgreen and Violet-Yellow Rhythms”, pictograms of fir trees transform formal French cubism into the enchanted forest of German fairy tale. The painting glows with an inner nocturnal light, a hallmark that makes mysterious even the architectonic compositions of the artist’s Bauhaus years. Klee’s tall, abstracted cities, as in the sonorous purple-yellow “Architecture” or the black-mauve curves and cubes of “Picture of a Town”, are fantastical places, Jerusalem or Parnassus conceived out of complex overlapping rectangular planes soaring up to triangle-towers.